To boldly go where your taste buds haven’t gone before, part II. The Gölles family has been cultivating orchards around Riegersburg in the region of Styria (near the borders of Hungary and Slovenia) for four generations. Since the beginning of the 1980s Alois Gölles is running the show. They have specialised in manufacturing fine vinegars and premium spirits. This Schnaps is distilled only from selected Wild Rowanberries, picked in the high pastures of Styria. Hence a richer, more intensive taste than their cultivated cousins. Throughout history the Vogelbeer (European Rowan or Rowanberry) was considered as very healthy and special, due to the large amount of Vitamin C. An old saying said that if you eat or drink them, you will live one year longer. So go on, drink! To a long life! At least 40 kg of fresh fruit is required for 1 liter of Vogelbeer distillate. 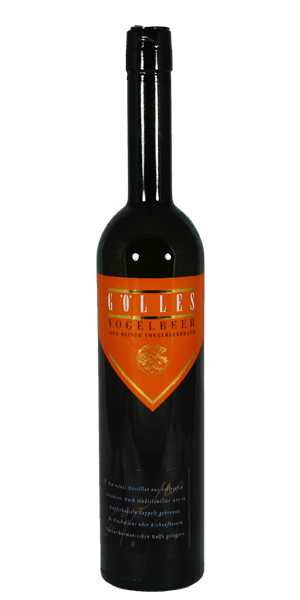 What does Gölles Vogelbeer taste like? The Flavor Spiral™ shows the most common flavors that you'll taste in Gölles Vogelbeer and gives you a chance to have a taste of it before actually tasting it. Clear and emulsive. Distinctive floral aroma of citrusy quince, cherry, bitter almonds and marzipan on the nose, opulent with rich fruit flavours, explosive spiciness, slightly acerbic… artichoke, broccoli, menthol, dark chocolate and green walnuts on the palate. Well-balanced, concentrated and bold finish of wild berries. “I was not prepared!” Captain Kirk.